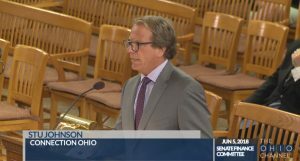 Stu Johnson, Executive Director of Connect Ohio, testified during the June 5, 2018 hearing. 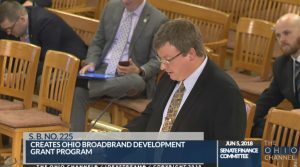 Columbus, Ohio (June 6, 2018) – Expanding broadband in Ohio is so important to those living in the Buckeye State that more than 20 people submitted testimony on June 5, 2018 to the Senate Finance Committee in support of Senate Bill 225. The bill seeks to create the Ohio Broadband Grant Program, which would provide funding opportunities for broadband expansion into unserved and underserved parts of the state. Senate Bill 225 would allocate $1 million annually for broadband research and analysis that would help Ohio maintain its broadband research capacity. To ensure the funds are invested effectively, the bill would require that mapping of broadband access would be done yearly by the state and at a more granular level than required by the Federal Communications Commission (FCC) through its Form 477 reporting. Right now, the FCC asks ISPs to report coverage at a census block level. This can lead to an inaccurate picture, especially when rural census blocks can be very large, a few larger as the state of Connecticut in some parts of the country, and even if only one household has coverage, the entire block is counted. 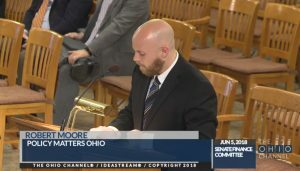 During the hearing on SB225, educators, business owners, and advocates for families spoke to Ohio Senators about the impact broadband—and lack of broadband—can have on everything from business to education across the state. “Broadband is not just infrastructure; it is a vital utility critical to the well-being of everyone in the Buckeye State,” Nancy Richison, Global Institute for the Study of the Intelligent Community, said in her testimony. More than 30 states have put in place legislation, introduced bills, or started research on policy opportunities in the areas of broadband and/or mapping. It’s now Ohio’s turn. “This legislation is smart, good government—by including granular, validated broadband mapping, the broadband grant dollars indicated in this legislation will be meaningfully and purposefully spent in order to deploy access to the thousands of Ohioans who truly need it,” Frederick said. Not only are legislators and state leaders looking at fixed broadband service in their states, but the FCC has received pushback on their recently-released map of areas eligible for Mobility Fund Phase II support. For example, in the last month, the FCC said West Virginia could challenge its decision to exclude some areas of the state from subsidies to expand mobile broadband. Nationally, more than $4.5 billion will be made available through the Mobility Fund Phase II auction for carriers to offer service in rural areas deemed eligible by the FCC. Senator Joe Manchin (D-W. Va.) argued to the FCC that the eligible areas map released by the federal agency overstated mobile coverage in his state. As a result, Senator Manchin filed a waiver requesting to challenge the FCC’s map which he believes incorrectly represents communities as having adequate mobile service. The granted waiver means Senator Manchin can now provide evidence from on-the-ground, outdoor speed testing on the lack of 4G LTE coverage through the Mobility Fund Phase II Challenge Process. To read and review the language in Senate Bill 225, click here.